Each Billy Boat Performance Exhaust system incorporates 3 generations of fabrication skill and racing talent. Every system starts with T-304 stainless steel, known throughout the industry as the highest quality material practical for after-cat exhaust applications. All exhaust tubing is mandrel bent on sophisticated CNC machinery for a precise fit and uninterrupted exhaust flow. The use of T-304 stainless steel flanges also offers high strength and complete resistance to harsh elements. All hangers, resonators, and tips are T-304 stainless steel as well. Billy Boat Performance Exhaust mufflers are crafted in-house with years of racing and street development invested into the design. Each muffler is tuned to match its application for the best possible performance gain and sound quality combination. For strength, the muffler end-plates are radiused at the inlet and outlet preventing premature cracking. Additionally, reinforcing gussets are used when necessary. Depending on the application, you can choose from 3 inch round tips with a rolled edge, 4.5 inch oval rolled edge tips, 5.25 inch oval rolled edge tips or DTM style tips for European applications. 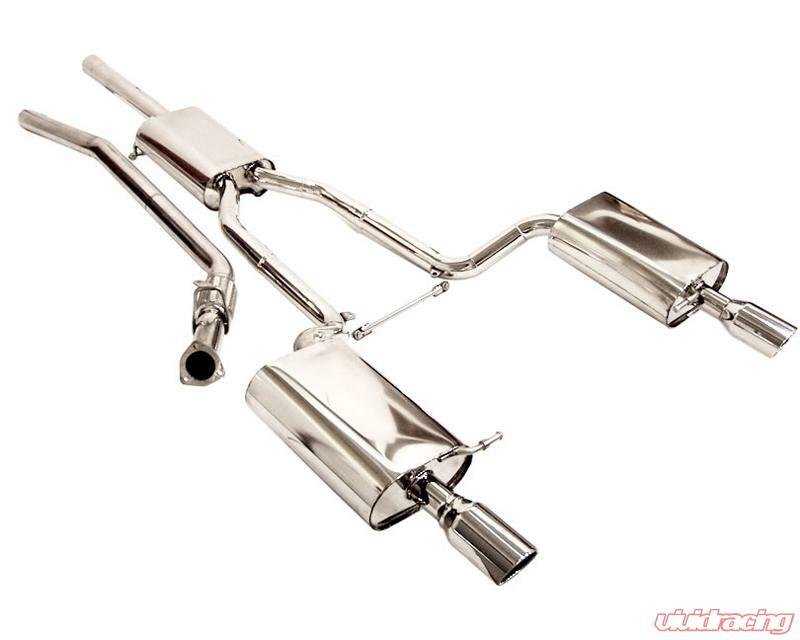 Billy Boat Performance Exhaust is known for their finely crafted catback systems. Mandrel bent for a smooth and even exhaust flow, their catback exhaust system frees up horsepower and torque that are wasted by the restrictive stock system. Manufactured from 100 percent stainless steel tubing, B&B catback exhaust features machined billet hangers, a combination of MIG and TIG welding and 3/8 inch stainless steel flanges for durability and precision fit. Using modern flow technology and their proprietary muffler design, each B&B system is custom-tuned to match its application - resulting in the best possible performance gain and sound quality combination. This free-flowing and light weight Catback exhaust system is designed as a direct bolt-on replacement for the restrictive factory exhaust and requires absolutely no modifications to the vehicle or the product installation. In addition to improving performance and sound, the fully-polished muffler and tips offer distinctive style and an aggressive look! Contact Us with any questions.